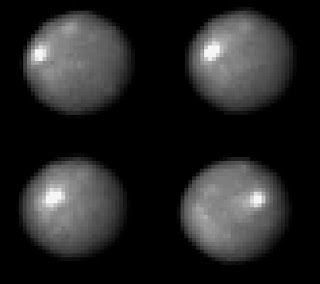 From Wikipedia: NASA's Hubble Space Telescope took these images of the asteroid 1 Ceres over a 2-hour and 20-minute span, the time it takes the Texas-sized object to complete one quarter of a rotation. One day on Ceres lasts 9 hours. The bright spot that appears in each image is a mystery. It is brighter than its surroundings. Yet it is still very dark, reflecting only a small portion of the sunlight that shines on it. Right here. Ceres is a particularly exciting target for exploration considering its frequent launch windows (compared to Mars), low gravity (= easier and cheaper to get back; landing is easier as well), shorter days (10 hours or so, = less night to get through before solar cells are recharged) and lack of weather (Martian sand storms interfere with generating electricity by both covering up the Sun as well as settling on solar panels and making it hard to collect electricity even when it's sunny). If you're interested in the subject too, sign up and leave a message there to add to the discussion. One question I've never been able to find the answer to: Dawn will be arriving at Ceres in 2015, but will we have better Earth-based observations of the planet before it arrives? How much more do we expect to find out about it in the next six years before Dawn gets there? Six years is still a very long time. So as you can see, the best time to observe Ceres until then is a mere three months away. Ceres could very well be an important hotbed of sapce commerce. Although it's very distant, the delta V requirements for reaching it's surface are low, lower even than the moon! That means, that if someone could set up some sort of automated system of bringing raw materials from ceres to earth, it could actually be cheaper than mining the moon. However, Any human presence on ceres would be hampered by the distance and length of the journey. Mining of ceres would have to be almost entirely automated in order to be competitive, meanwhile, astronauts on the moon could smelt moon rocks, and only need to send valuable metals and volatiles back, an automated system on ceres would mainly just bring rocks whose mass might be mostly waste. However, ceres is believed to be very high in volatiles, it may possibly harbor underground oceans, similar to Europa.